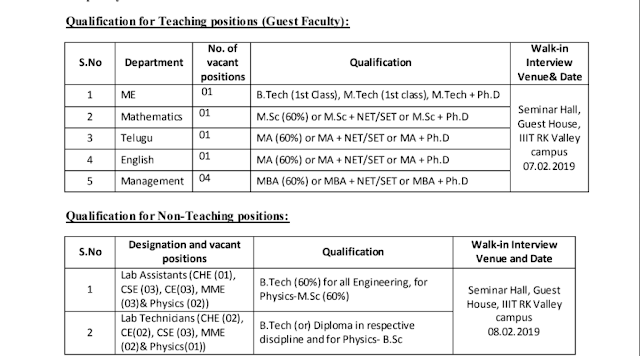 IIIT RK Valley, Rajiv Gandhi University of Knowledge Technologies, Andhra Pradesh (RGUKT - AP) has Released a Notification for Recruitment of Academic Assistants in the departments of Engineering (CHE, CE, CSE/ IT, ECE/ EEE, ME, MME) and Non-Engineering (Chemistry, English, Library & Information Science, Management, Mathematics, Physical Education, Physics and Telugu) on contract basis for the duration of 11 months. All Eligible and Interested candidates can attend to wallk-in-Interview on 7th and 8th Feb 2019 at Seminar Hall, Guest House IIIT RK Valley Campus along with 3 sets of Resume and Xerox copies of all certificates. 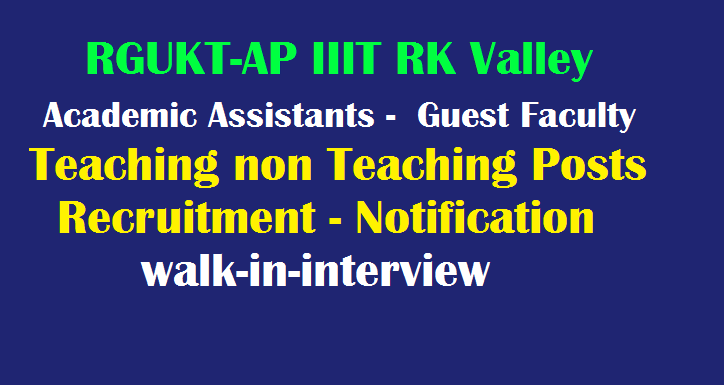 RGUKT - AP Academic Assistants Recruitment 2019 details like educational qualifications, remuneration, Interview dates are given here. Interested candidates are requested to attend walk-in interview with 3 sets of Resume and one set of Xerox copies along with Originals (for verification purpose) of all certificates as per scheduled slots. In the scheduled dates, interviews will be started effectively by 9:00 AM and candidates are requested to arrive to the venue by the time. IIIT RK Valley reserves right to not to fill up any of the above or all of the above advertised positions.